Unlike wood, vinyl doesn’t rot but it does crack and puncture over time. 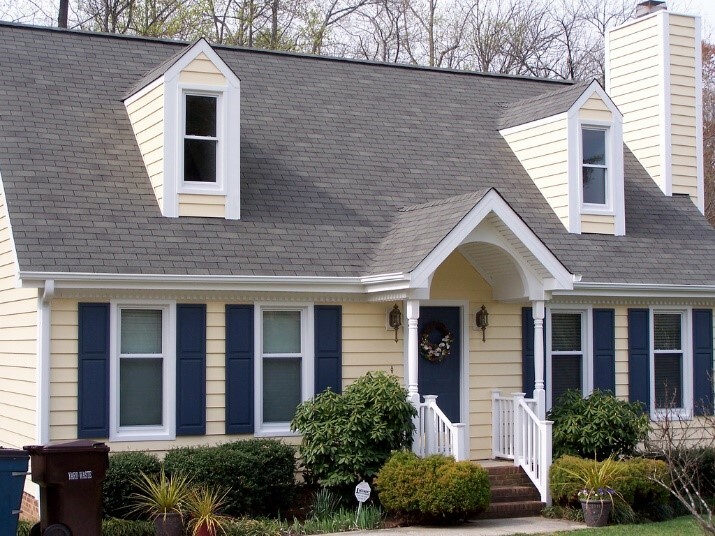 Like every other part of your home, your vinyl siding requires basic care and maintenance to keep it looking good as new. Here are a few basic maintenance tips to help your vinyl siding last a long time. Make it a habit to clean your siding at least once a year. Spring or summer might be a great time to clean your siding since it’ll be warmer out. Scrub the siding with a stiff-bristle brush or a sponge depending on how dirty it is. Use warm soapy water mixed with mild detergent, rinse off with a hose and let dry. You can use a pressurized hose to get to the far-to-reach places to wash off grime and gunk that has built up over time. If there are any plants or greenery near the house make sure to cover them with a tarp so they don’t get dirty soapy water on them. Vinyl color is in the entire material instead of the surface so it can’t really be peeled off. If you want to change the color of your siding without having to purchase new siding, you can just paint over them. Use 100% acrylic paint for best results. Unfortunately, paint is just on the surface so it will wear and peel over time and repainting will be required to keep that color looking fresh. Vinyl can get brittle and crack due to cold weather and extreme heat conditions. One benefit, however, is that vinyl doesn’t rot like wood or bend like aluminum. To help it last longer, be careful about parking or leaning heavy equipment like lawn mowers or bikes against your siding. However, for damaged sections, repair and secure them properly. In addition to these basic care tips, don’t forget to regularly inspect your siding to make sure it’s still in great shape and are not hiding moisture in the walls. If you’re looking to replace your siding all together, Peoples Products provides quality Stylelite Premium Siding. Get your free estimate here! We look forward to hearing from you. Let us know in the comments if there are other things you do to keep your vinyl siding looking good as new.